Memory problems are too quickly diagnosed as Alzheimer's. (In Alzheimer's, the culprit is amyloid-plaque in the brain.) New research shows a more common memory-culprit may be vascular dementia, caused by stroke, mini-stroke and high blood pressure. Learn the difference and why the right diagnosis effects therapy and treatment. For example, the damage caused by plaque is typically treated with acetylcholinesterase inhibitors like Aricept®. These drugs target the nervous system. Vascular problems like mini-strokes are treated with blood-targeting medications and therapies. Alzheimer's disease and vascular dementia are two types of dementia that are common in the elderly. A person's dementia can even be caused by a combination of the two, called "Mixed Dementia." With today's technology, both vascular brain injury as well as beta-amyloid plaque can be detected in the brain. They both cause memory and thinking problems, called "cognitive impairment". If the cognitive impairment is strong and interferes with a typical person's day, it is called dementia. If it is mild, it is called MCI (Mild Cognitive Impairment). Until now, doctors generally assumed that when they saw cognitive impairment, it was probably from plaque building up in the brain. Treatment and therapy were given accordingly. New research is showing that vascular brain injury from strokes or the mini-strokes often caused by high blood pressure may deserve the greater part of their attention. A study at the Alzheimer’s Disease Research Center at UC Davis has found that vascular brain injury from conditions such as high blood pressure and stroke are greater risk factors for cognitive impairment among non-demented older people than is the deposition of the amyloid plaques in the brain that long have been implicated in conditions such as Alzheimer’s disease. Published online early today in JAMA Neurology (formerly Archives of Neurology), the study found that vascular brain injury had by far the greatest influence across a range of cognitive domains, including higher-level thinking and the forgetfulness of mild cognitive decline. 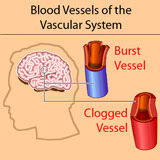 The researchers also sought to determine whether there was a correlation between vascular brain injury and the deposition of beta amyloid (Αβ) plaques, thought to be an early and important marker of Alzheimer’s disease, said Bruce Reed, associate director of the UC Davis Alzheimer’s Disease Research Center in Martinez, Calif. They also sought to decipher what effect each has on memory and executive functioning. “The more vascular brain injury the participants had, the worse their memory and the worse their executive function – their ability to organize and problem solve,” Reed said. The research was conducted in 61 male and female study participants who ranged in age from 65 to 90 years old, with an average age of 78. Thirty of the participants were clinically “normal,” 24 were cognitively impaired and seven were diagnosed with dementia, based on cognitive testing. The participants had been recruited from Northern California between 2007 to 2012. The study participants underwent magnetic resonance imaging (MRI) ― to measure vascular brain injury ― and positron emission tomography (PET) scans to measure beta amyloid deposition: markers of the two most common pathologies that affect the aging brain. Vascular brain injury appears as brain infarcts and “white matter hyperintensities” in MRI scans, areas of the brain that appear bright white. The study found that both memory and executive function correlated negatively with brain infarcts, especially infarcts in cortical and sub-cortical gray matter. Although infarcts were common in this group, the infarcts varied greatly in size and location, and many had been clinically silent. The level of amyloid in the brain did not correlate with either changes in memory or executive function, and there was no evidence that amyloid interacted with infarcts to impair thinking. Reed said the study is important because there’s an enormous amount of interest in detecting Alzheimer’s disease at its earliest point, before an individual exhibits clinical symptoms. It’s possible to conduct a brain scan and detect beta amyloid in the brain, and that is a very new development, he said. “The use of this diagnostic tool will become reasonably widely available within the next couple of years, so doctors will be able to detect whether an older person has abnormal levels of beta amyloid in the brain. So it’s very important to understand the meaning of a finding of beta amyloid deposition,” Reed said. Other study authors include Natalie Marchant of UC Berkeley and the Buck Institute for Research on Aging; Roxana Dhada and William Jagust of UC Berkeley; Charles DeCarli and Dan Mungas of UC Davis; Stephen Kriger and Micheal Weiner of UC San Francisco and Nerses Sanossian, Wendy Mack and Helena Chui of the University of Southern California. The research was supported by grants number AG012435, AG00266 and AG10129 from the National Institutes of Health. It research article can be considered as a milestone paper , tbat proved that one of the main starters of AD and others age-related dementias are the ageing-related macro and microvascular brain disorders. The article comproves again that the betamyloid acccumulation it is more for a "witness" (some times a toxic witness) than the culprit of dementias as AD.